If you are just starting with rubber stamping you will need to know about the different types of stamps available. In this article, we look at clear stamps. Clear stamps are known by different names. As well as being called acrylic stamps they may be called polymer stamps, photopolymer stamps, clear rubber stamps or any variation on the above. They all fall under the heading, however, of 'clear stamps'. When attached to a block, clear stamps can be used repeatedly in a similar manner to a traditional stamp. 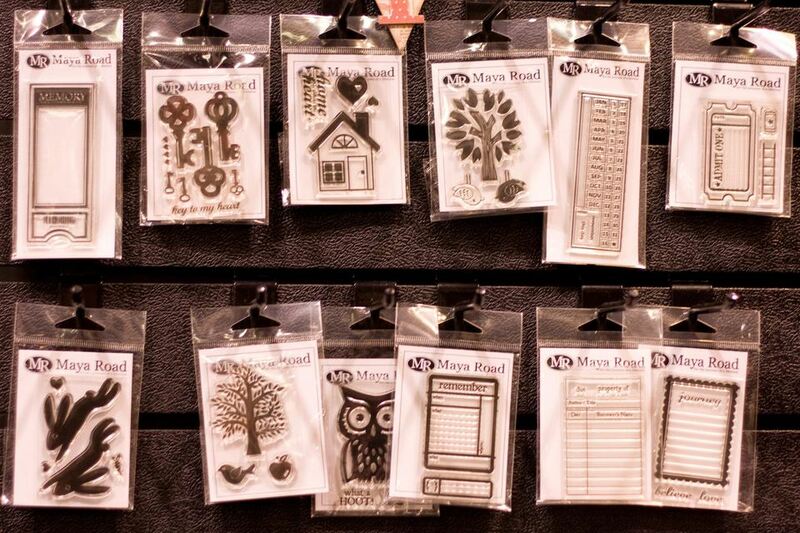 Clear stamps are readily available from rubber stamping and craft stores, as well as online. How Are Clear Stamps Used? Clear stamps are very easy to use, however they do need to be attached to a smooth surface prior to stamping. Special acrylic blocks are sold for this purpose and these are ideal as they are completely clear and are found in a variety of shapes and sizes. To use, the stamps are simply removed from the protective backing and attached to the block. The stamps are then dabbed with ink and used as normal. The stamps can be combined or arranged on the block as required, giving a wide range of design opportunities. The correct storing of any stamp is important to preserve the stamping surface and to ensure that it continues to produce top quality images. Most clear stamps come attached to a backing and the stamps can be reattached to this protective backing for storage. Many stampers also use other systems for storing their clear stamps and this includes CD cases and plastic wallets. Some stamp manufacturers sell their stamps in CD cases and this makes them easy to store as CD racks are widely available. Cost – Clear stamps are often cheaper than traditional rubber stamps. Cheaper to Deliver – These stamps are cheaper to deliver as they are light and less bulky than mounted stamps. Ease of Use – The stamps can be used immediately with a single acrylic block without having to mount or prepare the stamps in any way. Accurate Stamping – The clear stamps and clear stamping block mean that it is easy to accurately place stamps. Storage – Clear stamps are simple to store and do not take up much room. Loss of Stickiness – The stamps can lose their stickiness due to dirt or dust (although washing the stamps in water may help to restore the stickiness). Image Quality – Many clear stamps give a slightly softer stamped image than traditional rubber stamps. Tearing – The stamps are soft and can tear when being removed from the backing sheet. Fiddly - Some of the tiny stamps can be fiddly to use and to clean. Blocks - Blocks are required in order to use the stamps and this can add to the cost. Some stampers report better results if they stamp on a slightly giving surface such as a mousepad. Follow any specific manufacturers instructions regarding cleaning and storing the stamps. Some inks will stain the stamps, however, this does not affect their use. Clean the stamps in a bowl and drain them in a colander or drainer - this will stop any stamps from slipping down the plug hole. When starting, buy a single large acrylic block and this will be big enough for most stamps.